How many times have you wished you had a storage building to house all of the extra stuff that just doesn't fit in your house or garage? American Steel Span has the solution to your dilemma. A steel storage building from American Steel Span is an affordable answer yielding maximum useable space for a minimal financial investment. 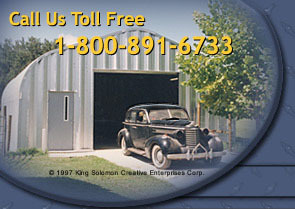 Steel storage buildings can be insulated and they are weather-proof so your valuables will be safe and sound. In addition to being functional steel storage buildings are attractive and come with your choice of six colored endwalls to match your home. On several models sidewall panels are available in two colors for storage buildings. To complete the package coordinating trim puts the finishing touch on your storage building.